Vietnamese bò kho, or braised beef, was a comfort food while I was growing up. 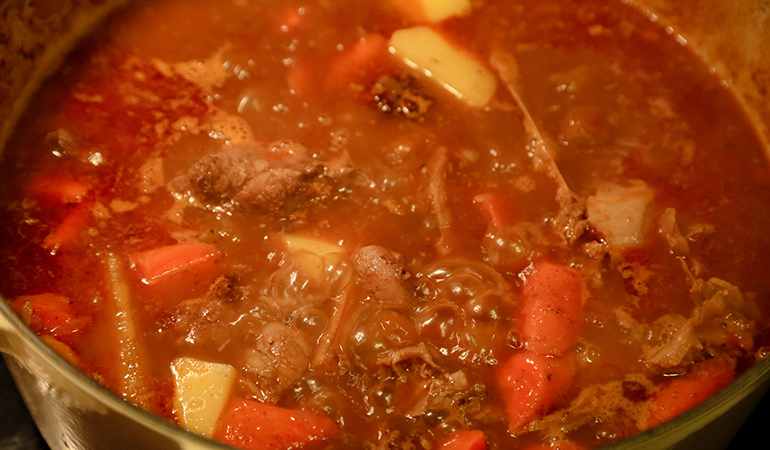 My mom made this stew year-round because we liked it so much. 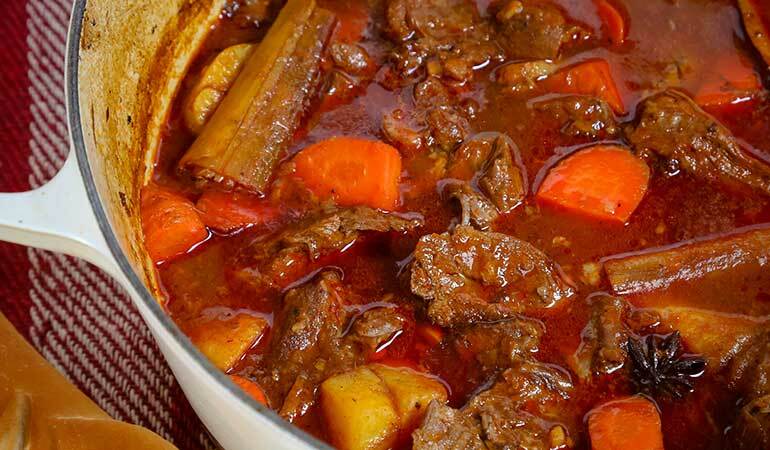 The flavor of this venison version is unlike any American/European stew you’ve ever had. 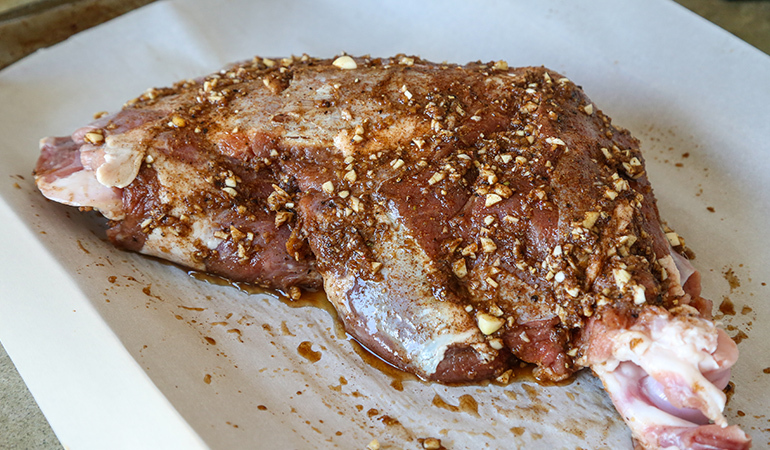 If you live in colder climes, this is a good venison recipe to add to your repertoire. This dish lends itself well to cuts of venison that are full of silver skin and gristle, such as the shoulder, neck or shanks on a deer. Cooking times will vary. I was gifted shoulders from a young deer, and it took about 1 hour and 30 minutes to tenderize. An older deer may take closer to 3 hours to get to where you want it. This recipe would also work well with other game animals such a moose, elk, antelope and bear. Cut venison shoulder into large stew-size pieces and do not remove silver skin. In a large bowl, combine fish sauce, grated ginger, sugar, Chinese 5-spice powder, freshly-cracked pepper and minced garlic. Mix in the meat, cover and refrigerate overnight or at least 20 minutes on the counter. You may also marinate and braise the whole shoulder if desired. You will have to shred the meat off the bones later. I stewed with the bones for more flavor. Coat the bottom of a heavy pan with oil, such as a Dutch/French oven. Heat the oil to medium to medium-high and brown meat in batches. Set meat aside. You can cut your venison shoulder into smaller pieces or keep it whole, and then remove the meat from the bones after cooking. Add more oil if necessary and lower heat to medium. Add sliced onion, a pinch of salt and sauté until softened, about 5-7 minutes. 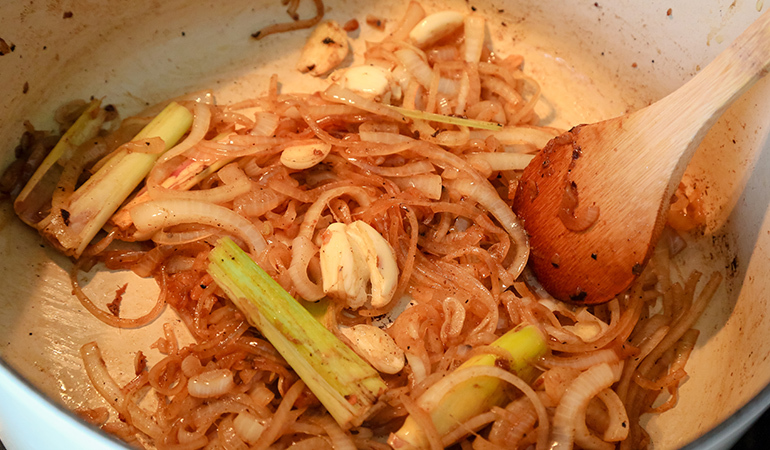 Next, add lemongrass (entire stalks – cut/bend them as necessary to fit into the pot), tomato paste, star anise, sliced ginger and cinnamon stick. Sauté for about 30 seconds, stirring constantly. Add coconut juice, crushed garlic, chili powder, paprika, apple cider vinegar, and return the browned venison to the pot. Add enough water to submerge all ingredients. Scrape the bottom of the pot with a wooden/plastic spoon. Bring to a boil, then take off heat. Cover the pot with foil, place the lid on top of the foil and braise in a 350-degree oven for 2 hours to 2 hours and 30 minutes until tender; time will depend on the age of the deer. 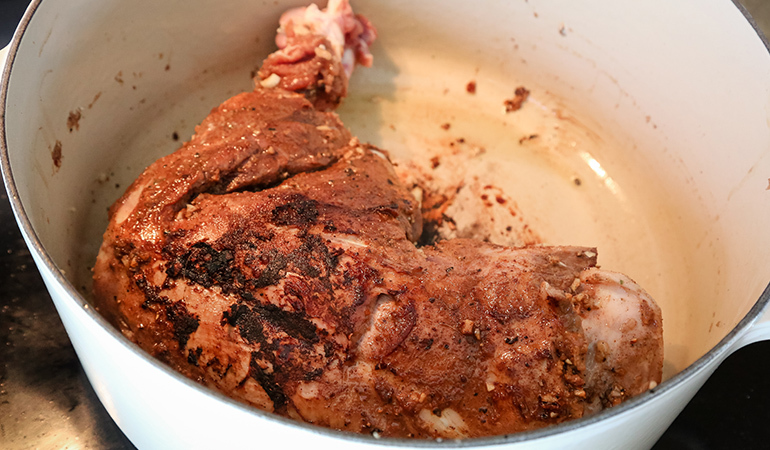 If cooking a whole shoulder, shred the meat when tender and return to the stew. Thirty minutes before the venison finishes cooking, discard the foil and add carrots and potatoes. Return the lid and continue cooking until “vegetables” and meat become tender. 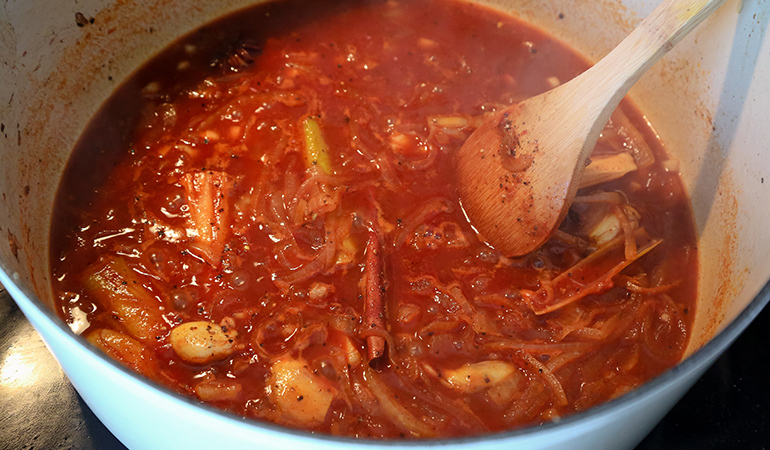 If the stew is too loose, simmer uncovered on the stovetop to reduce the sauce. Season venison stew to taste with fish sauce, salt, pepper and chili. Discard lemongrass, sliced ginger, star anise, cinnamon stick and bones (if any) before serving with Vietnamese-French bread or other crusty bread on the side.